The vast majority of Islamic terrorists who were being held inside Egypt's prisons have escaped in recent weeks, WND has learned. The information raises the prospect of further instability in Egypt, in particular in the region of the Suez Canal, which carries about 8 percent of global seaborne trade. According to information obtained by WND from Egyptian security officials, out of hundreds of jailed terrorists, only nine Islamic terrorists currently remain in any Egyptian prison. Those terrorists include two from the Palestinian Islamic jihad; one Hezbollah militant; one member of the Al Aqsa Martyrs Brigades, the declared military wing of Fatah; and three members of Jihadiya Salhafiya, which is an Islamic group allied with al-Qaida. The jailed terrorists include three recaptured Palestinians who had escaped from prison and who were part of a larger cell suspected of planning attacks against tourist sites and economic targets, including the Suez Canal. WND reported those three were recaptured earlier this week. Seven more members of the cell, including gunmen from Hezbollah and the Iranian Revolutionary Guards, are at large after escaping from prison amid the recent riots in Egypt targeting the regime of President Hosni Mubarak, the intelligence official said. The speed with which the three Palestinians were captured and the priority given to the escaped cell at a time Egypt's military is busy quelling weeks of unrest clearly testifies to the magnitude of fear Egypt has over the terrorist cell. 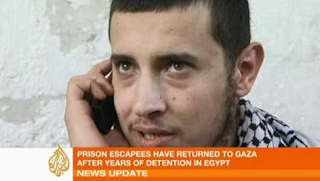 An Egyptian intelligence official said the other seven cell members are thought to have escaped Egypt for the neighboring Gaza Strip. He said the Egyptian military is interrogating the recaptured Palestinian convicts to determine why they had stayed behind in Egypt. WND first reported last week the cell suspected of planning an attack targeting the Suez had escaped from jail. Members of the cell were arrested in June 2009. At the time, Egypt's public prosecutor, Abdel-Magid Mohammed, announced the country had arrested 13 alleged Hezbollah agents on suspicion of planning attacks inside Egypt. In 2009, WND first reported Iranian soldiers aiding the Hezbollah members were nabbed in Egypt. A senior Egyptian security official, speaking from Cairo, told WND in 2009 his country had information Hezbollah cells – working with the Iranian Revolutionary Guard – had been coordinating terrorist activities inside Egypt with al-Qaida elements known to be present in the Sinai. The accusation that Iranian-backed agents were working with al-Qaida could not be verified by Israeli security officials. If accurate, it would mark a major turning point for Hezbollah, which has openly clashed with al-Qaida over ideology. Hezbollah espouses a strict Shiite Islamic belief system, while al-Qaida adheres to fundamentalist Sunni Muslim beliefs. Al-Qaida has been fingered in a string of major, deadly suicide bombings inside Egypt the past few years mostly targeting hotels and other tourist sites. The Egyptian government previously has admitted it was likely al-Qaida was still operating in the Sinai. The Egyptian security official speaking to WND said the Hezbollah-Iranian agents in Egypt were working with al-Qaida to plot attacks against tourist sites, particularly those known to be popular with Israelis. According to separate informed security officials with direct knowledge of the situation, Hezbollah, working directly with Iran, began setting up cells inside Egypt at least two years ago. The cells consisted of well over 80 agents, said the sources. The goals of the cells operating inside the country include plotting to destabilize the Egyptian regime to advance Iranian interests, planning attacks against tourist sites with Israeli casualties in mind, aiding Hamas in Gaza and establishing a base of Iranian operations along the strategic Suez Canal. The pan-Arab daily Asharq al-Awsat reported Egypt arrested the chief of the Hezbollah cell, identified as Sami Shehab. The newspaper claimed Shehab confessed his cell monitored tourist sites in the Egyptian resort cities of Taba, Dahab and Sharm el-Sheikh, and tracked Israeli ships passing through the Suez Canal.